Description: Vivid chart of Dublin harbour marking recent and proposed construction. Detailed soundings noted across the estuary. Printed colour. 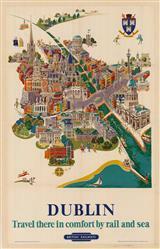 Description: Attractive city plan of Dublin printed at the end of the 19th century. Printed colour. Description: Detailed map of Dublin and environs. Printed colour. Description: Dublin. Detailed plan of Dublin, marking schools, public houses, churches and hospitals. Printed Colour.